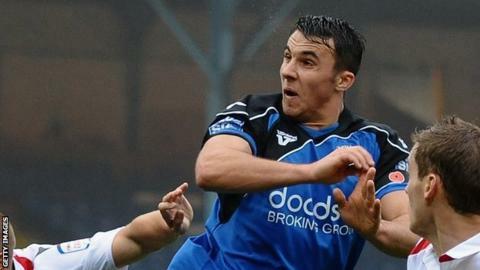 Scott Spencer's brace saw Halifax return to the play-off places after an easy win over inconsistent Barnet. The Shaymen took the lead after six minutes as Spencer turned in a parry from Bees keeper Graham Stack, who had initially saved Lee Gregory's effort. Gregory grabbed his 100th goal for Halifax to put the away side two goals up, heading in Chris Smith's flick. Spencer's thumping finish made it three before the break before Lois Maynard fired home early on in the second half. The victory saw Halifax leapfrog Braintree, who had earlier denied league leaders Luton promotion with a 3-2 win at Kenilworth Road, back into sixth place with a two-point cushion. Barnet's chances of reaching the play-offs slimmed even further, with the Bees five points off the pace with only three more games left to play. Match ends, Barnet 0, FC Halifax Town 4. Second Half ends, Barnet 0, FC Halifax Town 4. Substitution, FC Halifax Town. Ryan Crowther replaces Chris Smith. Substitution, FC Halifax Town. Josh Wilson replaces Paul Marshall. Substitution, FC Halifax Town. Adam Smith replaces Scott Spencer. Attempt missed. Marc Roberts (FC Halifax Town) left footed shot from outside the box misses to the left. Assisted by Paul Marshall. Attempt blocked. Matthew Pearson (FC Halifax Town) right footed shot from the left side of the box is blocked. Attempt missed. Lee Gregory (FC Halifax Town) right footed shot from the centre of the box misses to the left. Attempt missed. Lee Gregory (FC Halifax Town) right footed shot from the left side of the box misses to the right. Goal! Barnet 0, FC Halifax Town 4. Lois Maynard (FC Halifax Town) left footed shot from the left side of the box to the bottom right corner.